Zach Cozart is a prime example of the Reds new draft philosophy. Under Chris Buckley, they have focused more of their efforts on the premier defensive positions. Over the past few drafts, the Reds have targeted players who play in the center of the diamond and possess high baseball IQs. Instead of players with unrefined, raw skills, the Reds have drafted baseball rats. Guys who eat, drink, and sleep baseball. Todd Frazier, Devin Mesoraco, Drew Stubbs, and Zach Cozart all fall under this category. While Cozart admittedly has the lowest upside of the four, he's also not without intrigue. Obviously, the Reds drafted him for his glove work, but he doesn't seem completely inept at the plate. In fact, he had more walks than whiffs in 2007, which is always a good sign. In addition to his work at Ole Miss, Cozart has also spent time playing for the U.S. National team, which should provide him invaluable experience against international level of competition. 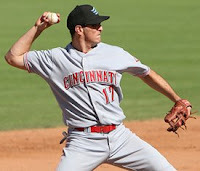 After he was drafted in 2007, the Reds sent Cozart to low-A Dayton, where he posted a .239/.288/.332/.620 line in 53 games. He hit linedrives at a paltry 6% clip, while hitting the ball on the ground 52% of the time. He was clearly over-matched, which is disappointing given that Cozart was drafted out of college. Some believe that top college competition is equivalent to double-A competition level. So, to see Cozart be completely over-matched by low-A pitching is disconcerting, though not really unexpected given his reputation. He also wasn't great with the leather, making 9 errors and posting a .956 fielding percentage in 46 games at shortstop. In light of his 2007 struggles, the Reds had no choice but to return Cozart to low-A Dayton in 2008, where Cozart displayed increased competence at the plate. Cozart took a significant step forward on offense during the 2008 season. The Reds decided to send Cozart back to low-A Dayton, where he posted a respectable line of .280/.330/.457/.787 with 14 homeruns and a 77/24 K/BB ratio. He drove the ball with more authority, as evidenced by his improved homerun rate and his much improved 16% line drive rate. He also improved defensively, committing 10 errors and posting a .978 fielding percentage in 102 games. It's difficult to measure minor league defense with statistics, as the best defensive metrics just aren't available, but at the very least Cozart made errors at a much lower clip in 2008. Another sign that he may have just been jittery and nervous during his first professional experience. In 2008, he obviously had a greater understanding of what it takes to be successful at the professional level and he was better across the board. Of course, repeating the level and facing low-A competition didn't hurt either. I must admit, the more I see of Cozart, the more I like him. He doesn't have eye-popping tools, by any measure, but he may have just enough when coupled with his baseball IQ to be an effective MLB player. At the plate, he has a simple, solid set-up. He stands very upright at the plate and uses a wide stance. However, he hits off his front foot and uses very little lower body in his swing. It's mostly an arm-swing, which may help explain his lack of power. Even though it's just an arm-swing, it's short and compact. Cozart is a bit pull happy at the plate, which helps him hit more homers, but may harm his overall production. He'd likely be a more complete, well-rounded hitter if he used the whole field. He doesn't have the tools at the plate to try to pull everything, rather he'd be better off taking what the pitcher gave him and hitting the ball to the opposite field. In addition, Cozart has decent bat speed, so it's not like he goes into battle with the pitcher unarmed. Anyway, here are a couple of clips of Cozart at the plate, one with the Dayton Dragons and one with Ole' Miss. On defense, he has good, soft hands and a strong, accurate arm. However, he throws from a lower arm slot than is typical for a shortstop, but so far it works just fine for him. Still, as good as his hands and arm may be, I still question whether the range is there for him to be a top tier MLB shortstop. And, in the final analysis, range is the most important component of defensive performance, as it doesn't matter if you convert every ball you get your hands into an out if you are getting to signficantly fewer balls than other shortstops. He has good baseball instincts, which should help with both his defensive positioning and reading the ball off the bat. His instincts should help his defensive tools play up a tick. That said, his speed is below average and may only get worse as he advances up the ladder and continues to fill out. And, of course, Cozart is the type of player who will only go as far as his glove will take him. You can see his MLB scouting video here. Overall, it's still too early to draw conclusions about Cozart. He's the type of player that I typically like, as he's good defensively, possesses an understanding of how the game is played, and his total game is greater than the sum of its individual parts. His baseball IQ helps his somewhat limited tools play up a tick and he understands the nuances of the game. That said, his offensive performance is of concern. His 2007 debut was terrible and while his 2008 performance was better, it must be pointed out that he was a college player repeating low-A ball. Even so, 2007 could have been caused by nerves or fatigue from playing more games than he ever had in the past. Or, it could simply have been that he was overmatched at low-A. The 2009 season will give us another data point for his career trajectory. The Reds will likely send him to high-A Sarasota for the full season (it seems doubtful that the Reds will push him to double-A in 2009) and his performance will reveal a great deal. If he can hold his own at high-A and put up a similar level of production to his 2008 level, then he may establish himself as a prospect of note. I suppose the real question is about Cozart's defense. Just how good IS he? That's the question that determines just how good his bat has to be to make him a legitimate prospect. I have heard Cozart compared to Adam Everett defensively, but I'm not ready to buy into that as Everett is almost a once in a generation type player with the glove. Even so, if he is THAT good, then his glove will carry his bat, regardless of how poorly he uses it. At this point, Cozart's career trajectory is still up in the air. Another season will go a long way towards establishing his performance level both on offense and defense. His ceiling seems to be that of an above defensive shortstop with #2 hole hitting skills. Or, he could flame out as a career minor leaguer who doesn't have the glove to carry his weak bat. Time will tell. For now, he checks in at #20. For Travis Wood, the 2008 season was the best of times and the worst of times. He enjoyed significant success early in the season, but struggled in the second half against more advanced competition. Even though he struggled at times in 2008, he still maintains a solid professional stat line with a 4.13 ERA, 1.35 WHIP, and a 353/172 K/BB ration in 361.2 innings pitched. Wood joins Matt Maloney and Pedro Viola as the top southpaw prospects in the system. It was truly a tale of two cities for Travis Wood in 2008, as he pitched exceedingly well for high-A Sarasota, but then pitched equally poorly for double-A Chattanooga. At Sarasota, Wood worked 46.2 innings posting a 2.70 ERA, 1.29 WHIP, 41/22 K/BB ratio, and a 1.16 GB/FB ratio. In his 9 starts, he posted a 3-4 record and was soon promoted to double-A Chattanooga. At Chattanooga, Wood saw first hand why the jump from single to double-A ball is considered the most challenging in all of professional baseball. Wood pitched 80.0 innings, posting a 7.09 ERA, 1.74 WHIP, 58/48 K/BB ratio, and a 0.85 GB/FB. The more advanced competition brought about a 2% increase in walks allowed and a 5.3% drop in strikeouts. Obviously, double-A competition was beyond anything Wood had seen before. On the plus side, Wood was still young-ish for the league, as he was only 21 years old. So, he was facing more advanced and mature competition, which certainly accounts for his struggles. However, he'll have to bounce back strong in 2009 when he gets another crack at double-A to solidify his prospect status. Wood still possesses the best change-up in the system, but his fastball velocity has never returned to the consistent 93-94 mph it attained in high school and his breaking ball continues to be inconsistent. Wood is still trying to refine his curveball, which can roll and stay up coming out of his hand. That said, Wood does possess a top notch change-up, which is one of the best weapons a pitcher can possess. The change-up is a true pitcher's pitch and one that fewer pitchers actually master than one might expect. It's one thing for a pitcher to succeed just by reaching back and cutting a good fastball loose, but it's entirely another thing for a pitcher to succeed by changing speeds and hitting his spots. The former is typically a thrower, while the latter is a pitcher. Wood features a circle-change that breaks down and away from right-handed hitters, which may make it a nice weapon for combating a heavy platoon split. As I wrote last year, Wood possesses good, clean mechanics. His wind-up is carried out at a faster tempo than average, but it's not a concern because he manages to keep his body in sync. Here are some frames of his wind-up courtesy of "mwlguide:"
In frame 1, he starts off in a pretty standard ready position. In frame 2, you can see that he begins his windup with the small side-step that is popular in the modern game, rather than the step back towards second. And, as to be expected, the small side-step is accompanied by bringing the glove to the chest (which you can also see in frame 2) and not over the head like in the good the old days. In frame 3, he is beginning his leg kick and demonstrates good body control and balance. In frame 4, you can see the nice high leg kick and the good body coil. Note back in frame 3 how the line of his hips runs basically from 2nd base to home plate, while in frame 4 the line of his hips runs almost from 3rd base to 1st base. The high leg kick and coiling of the body enables him to store up energy to later impart on the baseball. In frame 5, he has already broken his hands and started to the plate. He is hiding the ball well, which increases his deception. In frame 6, he has driven off the mound and released the pitch. He hasn't thrown against a stiff leg, which allows in frame 7 for his upper body to finish over his glove side leg. His body is squared up and he is in good fielding position. In photo 1, Wood has a bit more flex in the knee and he is able to get out over his front leg. However, in photo 2, you can see how he throws against a stiff glove side leg. Given the position of the glove side leg in photo 2, it will be very difficult for his momentum to carry his upper body out over the top of his legs. The stiff plant leg leaves no other option than to pitch against his leg. His momentum will not get out over the top of his legs, but rather will be checked and pushed back towards second base by the stiff plant leg. Not only may it lead to inconsistency in his pitches, but it may also increase the stress on his body, as pitching against a stiff leg is a bit jarring and the body won't be able to absorb or distribute the shock very well. He may be advised to shorten up his stride a bit, as throwing against a stiff front leg and failing to get out over your plant foot is often the result of over-striding. Again, you can see his MLB scouting video here. Overall, as you can see, Wood has smooth and efficient mechanics. One potential cause for concern, however, is Wood's slight build. He's only 5-11 and weighs in at 166 lbs. Given his height, he is not going to be able to pitch on a downward plane, which isn't ideal because his fastball only sits in the 88-91 mph range as it is. So, he may have to work harder to maintain acceptable velocity. It may benefit Wood to add more strength to his lower body, as that may help take some strain off of his arm and potential give him a tick or two more velocity on his fastball. The best and most efficient pitchers throw with their entire body, not just their arm. Wood does a nice job coiling up his body and driving off the mound, but increased lower body strength may lower his risk of an arm injury. It's not uncommon for young prospects to struggle in their first taste of double-A ball. The competition level is a significant jump from high-A ball, so an adjustment period is only natural. However, Wood will have to demonstrate a better curveball if he is going to find success at double-A. The higher he climbs the ladder, the more varied his repertoire will have to be. He'll need to improve his polish on the breaking ball and maintain the 88-91 mph velocity on his fastball to compliment his stellar change-up, as pitchers have a much more difficult time finding success at the upper level by relying heavily on just one pitch. 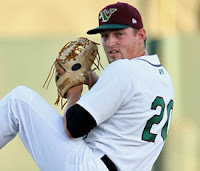 It won't take long in 2009 for Wood to reveal whether his 2008 struggles at double-A were the standard struggles of a young prospect or symptomatic of his inability to command an effective breaking ball. Travis Wood still wields the best change-up in the system, but he'll need to show more than that to find success at double-A next year. For now, he checks in at #19 on the list. Adam Rosales, a 12th round pick in the 2005 draft, is an enigma wrapped in a riddle. If Josh Ravin was the most depressing report to write up, then Adam Rosales may well be the most challenging. At this point, I'd be lying if I said that I knew exactly what to make of him, but let's take a look. 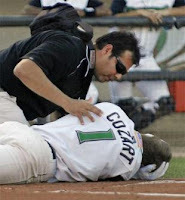 In 2008, Rosales had an extremely volatile season, which is in keeping with his entire professional career. The Reds sent Rosales to triple-A Louisville to start the 2008 season. On the season, Rosales posted a slash line of .287/.339/.463/.802 with a 82/22 K/BB ratio and 11 homers. The final line looks solid, but Rosales had to travel a difficult road to get there, as he started off the season ice-cold, but ultimately finished it white-hot. In April, he was ice cold with a meager .177 batting average and a paltry 9% line drive rate. His line wasn't much better in May, as he hit only .232, but he was driving the ball better as evidenced by his 22% line drive rate. In June, he finally got it going, hitting .299 with a .561 slugging percentage. In July, he kept it rolling by hitting .324 with a .471 slugging percentage and was even better in August hitting .436 and slugging .764. In sum, Rosales got progressively better in each passing month of the season and finished out so strong that he earned a call-up to the majors in September. Unfortunately, major league pitching did what its minor league brethren could not, which is to say they poured cold water on Rosales's white hot streak, limiting him to a line of .207/.233/.241. So, who is Adam Rosales? Is he the slow starter or white hot finisher from 2008? Is he the guy who posted a .946 OPS in 2005, a .726 OPS in 2006, a .904 OPS in 2007, or the .802 OPS in 2008? Is he a 1b, 2b, 3b, or shortstop? Ultimately, it's difficult to get a handle on Rosales, but once again it seems to come down to his place on the defensive spectrum. The farther to the left he can stay, the less offense he needs to provide. The farther to the right he slides, the more offense he has to provide to justify the position. Rosales has a swing only a mother could love. Ok, ok, so it's not that bad and it does have the advantage of actually being effective. Still, poetry it is not. Fortunately, Rosales adds a strong batting eye and good control of the strikezone, which really helps his swing play up. At the plate, Rosales has a pretty straight forward set up, using a slightly wider than shoulder width stance. His stance is square to the plate and he keeps his back elbow up. When he brings the bat up over his shoulder, he uses a bat waggle wherein he quickly and continuously moves the bat from vertical to horizontal while waiting for the pitch. When the pitch is delivered, Rosales basically rolls his front foot up onto the toe and puts it back down. He has very little forward stride in facilitating his weight transfer. At that point, Rosales begins his swing, which is top-hand heavy, especially when he tries to turn on the pitch. When he tries to turn on the pitch, he often throws the top hand at the ball and puts a lot of body into his swing. Instead of staying on the ball and looking down the barrel at contact, Rosales almost seems to pull the swing through the zone with his shoulders. This type of swing forces him to open up his front foot and body earlier than the more conventional swings, but Rosales makes it work. When he takes the pitch the other way he has to stay on the ball longer and his swing can be a bit less "top-handsy." 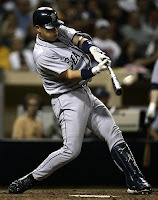 Even so, his overall swing mechanics create a downward plane to his swing (see photo: strong top hand action in swing). While it may be functional, the "chopping wood" approach isn't pretty. Still, production is what matters, as you don't get style points in baseball. Last year I wrote about the implications of Rosales's downward slide on the defensive spectrum. Fortunately, the reason he was shifted to firstbase was to rest a sore throwing elbow, not because he couldn't handle a more challenging defensive position. That's good news for both the Reds and Rosales, as his bat doesn't profile well at firstbase. It's difficult to know what the Reds plan to do with Rosales. He played primarily shortstop in college, but he just doesn't have the range to play there at the professional level. When he was promoted to the majors in 2008, he spent time at both secondbase and thirdbase. Ultimately, Adam's best position is likely thirdbase, as his range may be stretched at second. His range and lateral movement are good enough to handle thirdbase. Regardless, the presence of Brandon Phillips at secondbase means that it's not a real option for Rosales, so it's seemingly the hot-corner or bust. Despite the elbow soreness of 2008, Rosales's best tool is his arm, which is both strong and accurate. Given the very poor defensive performance of Edwin Encarnacion, it probably wouldn't be a bad idea to give Rosales an extended look at third, as I don't doubt that he's already a better third baseman than Edwin. However, the window may have closed on Rosales's chances to be an everyday player, as Edwin is currently blocking him and Todd Frazier and Juan Francisco are potentially better options for the future at the hot corner. I still wrestle with the likely future of Adam Rosales, as part of me thinks he has the bat and defense to be a league average starter. Ultimately, his bat will determine his future role. Still, given the makeup of the Reds' roster and the volatility of his performance, Rosales likely projects as a utility player. His versatility on the infield is a positive attribute and perhaps the one the Reds are most likely to utilize. Even if he doesn't become an everyday regular, he could still have good value to the Reds, as versatile utility infielders with solid offensive skills don't grow on trees. Ultimately, Rosales will go as far as his bat will take him, but right now he projects as only an MLB bench player. 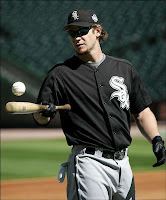 Is it time to consider signing Joe Crede? Now, I'll preface this by signing that I'm not much of a Joe Crede fan. If we were to roll the dice with a top draw defensive third baseman with limited offensive skills, then I'd put Brandon Inge well above everyone else. But, building a baseball team requires flexibility and practicality, so maybe it's time to consider someone like Joe Crede. First, Crede would likely be inexpensive. The market for corner position players is soft, so a reasonable contract would be a real possibility. In addition, the Reds have gone on the record countless times stating that they want a right-handed bat for leftfield. Well, maybe the best option for that particular role is already on the team. Maybe, just maybe, it's Edwin Encarnacion that should be playing leftfield, which would open up third base for Joe Crede. Crede, of course, hits righthanded, so he would balance the line-up a bit more, even if he would be a poor fit to hit fourth between Joey Votto and Jay Bruce. While it is undeniable that Crede doesn't have the offensive upside of some of the leftfielders being considered, he would give us a huge boost defensively, which may offset the difference in offensive value between Crede and a right-handed hitting leftfielder. He's had some back problems, so let's play it conservatively and say that he'll be good for 10.0 UZR/150 in 2009, which means that he's 10 runs above average on defense. Let's be generous and give Edwin his best level of performance and say he'll post a -11.5 in 2009, which means that he's 11.5 runs below average on defense. So, the difference between the two is 21.5 runs, which works out to roughly a 2 win improvement simply by replacing an iron gloved Edwin with a quality gloved Crede. And, of course, I don't think it's a stretch to say that Edwin would be at least as capable in left as Dunn was in 2008, which means there would be no corresponding decline in leftfield defense to take into account (now, the downgrade from Dunn's bat to Crede's bat is another story, but I digress). Unfortunately, Crede isn't much with the bat and his injury risk is a bit high, but there is improvement to be made with such a signing. In 2008, Crede's overall value to the White Sox was +18.1 runs, which makes him a 1.8 win player. His value would be higher for the Reds because of who he would be replacing, however, even standing alone Crede could prove to be a good value. The money value of a win to a team in 2009 is projected to be ~$5M. So, if Crede can produce 1.8 wins for the team, then his value to that team would be ~$9M. Given that the free agent market is soft and that Crede has a heightened injury risk, he'd likely command far less. In fact, I could see the Reds getting him for ~$5M and a starting job (roughly what he received last year), which would seem to make him a good risk and a solid acquisition, especially since he has the upside to produce more than 1.8 value wins for the Reds. In fact, I wouldn't be surprised if Crede signed for less than $5M, as the market on him isn't very robust these days. In the end, I suppose it all comes down to his ability to avoid injury, but at the right price that may be a risk the Reds would be wise to consider. Of all the prospect reports I'll write, this one is the most depressing. Josh Ravin has been my favorite pitching prospect since he first set foot in the Reds organization. He has a great combination of raw stuff and rock solid mechanics. Unfortunately, he also lacks an important skill for any pitching prospect: control. A mid-to-upper 90s fastball just isn't worth much if you can't control where it's going. I was expecting Ravin to take a step forward in 2008 after a rough 2007 season. Unfortunately, he didn't show any improvement at all with his control, racking up strikeouts and walks in equal measure (literally). Ravin still has top of the rotation stuff, a body type that scouts can dream on, and pitching mechanics that any coach would love. Unfortunately, all that adds up to very little these days, because he can't consistently get the ball over the plate, much less hit his spots inside the strikezone. Until he can do that, all of his other impressive attributes will be for not. Ravin started out the 2008 season in extended spring training, but it wasn't long before the Reds sent him to off to low-A Dayton. Given his performance last year, I thought that was the right level for Ravin, but was afraid the Reds would keep him in extended spring training until the Pioneer League started up again. Unfortunately, Ravin was once again plagued by control problems. On the season, he pitched 56.1 innings for the Dayton Dragons and struck out an impressive 47 hitters. However, he also managed to walk 50 hitters. And, not surprisingly, when you walk 8.0 hitters per nine innings, both your ERA (7.19) and WHIP (1.86) will be atrocious. You hear a lot about the hitters who are the "three true outcome hitters," (see: Cust, Jack) meaning that their plate appearances typical result in one of three outcomes (walk, strikeout, homerun) that are solely dependent on the hitter and free from interference of the other players on the field. At the rate he's going, Ravin may become the first "true outcome pitcher." When I look at Ravin's stats, two thoughts cross my mind: 1) just how damn good could this guy be with improved command and control? And, 2) just how many damn pitches does he have to throw to get through a single inning? I love late count hitters, but I don't want to see that attribute in my pitchers all that often. Even so, given just how many walks and whiffs he tallies, Ravin obviously has to work very hard in every inning he throws. That constant state of stress on the arm is cause for concern, as he rarely gets to cruise through an inning without throwing high stress pitches. Even so, his mechanics should go a long way towards reducing his injury risk. In 2008, Ravin struggled so mightily with the Dayton Dragons that he suffered the rare indignity of being demoted to the rookie Pioneer League. By that time, however, it was too late to salvage the season and he posted a 12/9 K/BB ratio in 12 innings with a 10.50 ERA and 1.83 WHIP for the Billings Mustangs. By any measure, it was clearly a lost season for Ravin. Whether it was a loss of confidence or a breakdown in mechanics, Ravin just never got on track in 2008. 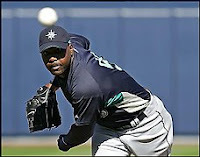 In his first professional season in 2006 as an 18 year old, Ravin posted a 40/23 K/BB ratio in 36 innings. In 2007 as a 19 year old, he posted a 39/41 K/BB ratio in 40.0 innings. And, in 2008 as a 20-year old, he posted a 59/59 K/BB ratio in 68.1 innings. That type of regression is alarming. The 2009 season will be key, as it may provide the final data point for a disturbing trend or it may re-establish Ravin as a prospect worth watching. I hope for the latter, but fear the former. Ultimately, time will tell. I waxed poetically (or, at least as poetically as I can) about Ravin's mechanics in last year's scouting report. So, I'll keep that to a minimum here, though I still think he has about the best mechanics in the system. Below are a few photos from Emily Smith that show Ravin's mechanics. Once again, they appear very clean. In the first photo, he has a good high leg kick and coil to store up energy. His body is well balanced over his plant leg and beginning to drive forward with his hips moving sideways towards the target. In the second photo, he has broken his hands and has begun to drive forward with his lower body. His hips and shoulders are both still pointed towards homeplate. His glove-side foot is closed until just before landing, which helps keeps the hips closed as long as possible. In the third photo, he has driven off the rubber and has taken a nice long stride. His arm is on track to be in the vertical position when his glove-side foot plants, which is an indicator of good timing in the delivery. His glove-side foot is on the verge of being planted pointing directly towards homeplate. Overall, Ravin has good tempo and body control, which gives him a fluid, under control delivery that generates substantial velocity. As of now, I continue to have a lot of faith in Ravin. Maybe it's just a stubborn streak in me, but I'm just not ready to give up on someone with his combination of pure stuff and top notch mechanics. Someone with those positives should be able to find a measure of control. The baseball world will just make a little less sense if he fails to find the consistent arm slot and release point needed to enable him to be an effective professional pitcher. Fortunately, time is still on his side, as he will only be 21 years old in 2009. He still has time to right his career. Also working in his favor is the fact that pitching prospects don't always develop in a linear manner like position prospects. If a position player isn't at a certain level of performance on the development time-line, then there is cause for concern. However, it's different for some pitchers, as it just takes some longer to figure it all out, but one day it all clicks into place and they flip the switch to become quality pitchers. Perhaps the best current example is Jeremy Guthrie of the Orioles, who didn't become an effective big league pitcher until the age of 28. Randy Johnson also struggled with his control, but eventually got it all figured out. Due to his height, Johnson struggled in the minors keeping his body in sync throughout his delivery, so maybe the 6-4 Ravin is having similar difficulties with his release point. So, there is reason to not write him off just yet. Even so, I'd be remiss if I didn't point out that guys like Randy Johnson and Jeremy Guthrie are the exception, rather than the rule. At this point, I'm not sure where Ravin will start the 2009 season. I would imagine the Reds will send him back to Dayton, as it's difficult to imagine them keeping him in extended spring training until the Pioneer League opens up. Still, his struggles at Dayton last year may force the Reds to keep him in extended spring training for a while to work on his mechanics. While I have yet to give up on Josh Ravin, it's clear that he needs to show some improvement with his control in 2009. He doesn't need to develop Maddux-esq command overnight, but he does need to cut down significantly on his walks and soon. Just cutting his BB/9 rate from 8.0 to 5.0 would be significant progress. A step forward is definitely needed, as while pitchers may not always develop in a linear line, they still actually need to develop. Unfortunately, Ravin has gone backwards since his 2006 debut and I expect most have just about written him off completely. For now, Ravin lands at #24 on the list due to his stuff, mechanics, and more than anything my faith in him. I know this ranking will again put me at odds with every other baseball prospect list, but evidently I'm from the Kid Gleason school of thought wherein "you have faith in your fellas and they'll come through for ya." Even so, if Ravin continues performing at his current level, his stats will soon outweigh his tools and he'll slide all the way off the list. For now, his upside is what keeps him on the list over more polished, lower ceiling prospects. Still, a failure to take a step forward in 2009 will make it difficult to view him as even being a legitimate prospect. Here's hoping that Ravin can develop a measure of control and begin to ascend up the rankings and towards his considerable ceiling. 2008 Redlegs Baseball Prospect Ranking: "Other Notables"
At this point in his career, Alexis Oliveras is still more about projection than production. However, I find him to be a much more interesting prospect than those older prospects who have developed to the point that they have reached far lower ceilings. It's the age old question, when valuing prospects how do you balance polish/certainty vs. projection/upside? For this list, when it is at issue, I'm putting more weight on upside than polish. Outfielders like Chris Heisey, Sean Henry, and Shaun Cumberland are more polished and are further along in the development time-line than Oliveras. However, none of that trio projects as anything more than a 4th outfielder at the MLB level. At this point, Oliveras is much less polished and has a long way to travel on the development time-line, but if he does then he has a greater chance to be an impact player than the players with the lower ceilings. Oliveras was drafted by the Reds in the 9th round of the 2007 draft out of the Puerto Rico Baseball Academy, Guaynabo, P.R. He was drafted at the age of 18. He was very raw and the Reds sent him to the Gulf Coast League, where he appeared completely overwhelmed. He posted a line of .191/.240/.253 in 47 games and 162 ABs. Clearly, he was raw and not ready for the professional game. In 2008, the Reds again sent Oliveras back to the Gulf Coast League to repeat the level. His second go around went much better than the first. He posted a line of .279/.345/.383/.728 in 39 games and 154 ABs on the season. The .728 OPS doesn't look all that impressive, but the Gulf Coast League OPS was only .687 and his team's overall OPS was only .654, so he was well above average on the season. Oliveras was white-hot to start the season, posting a line of .400/.526/.400 in 19 plate appearances in June. In 64 plate appearances in July, he posted a line of .351/.422/.509. Unfortunately, he posted a weak .208/.256/.273 line in 82 plate appearances in August to finish out the season. While his overall line was solid, there are a few redflags to his 2008 season. On the year, he hit line drives at a 10% clip and groundballs at a 63% clip. Given the age of the prospects in the GCL, I suspect that this is not uncommon. Clearly, Oliveras needs to get a bit more loft on the ball and increase his linedrive rate. In addition, he needs to add some strength to allow him to drive the ball with greater authority. However, his walk rate improved from 5.6% in 2007 to 8.5% in 2008. Oliveras spent the majority of his time in centerfield, logging 20 games there, but also spent 15 games in rightfield. He logged 2 assists in center and 2 in right. He seems to be a competent outfielder, but his value would jump if he can stay in center, as he may not develop the bat to be a starting corner outfielder. In fact, his professional career may hinge on his ability to stick in center, though it'll depend on how well his bat develops. Once again Alexis failed to put together a quality full season of play, but he did take a significant step forward. 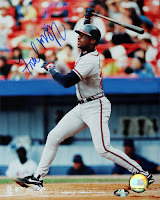 Not to mention, I can't help but be encouraged by his swing, which seems to be one that can make him a viable prospect. While Oliveras certainly doesn't possess his tools or raw ability, his body type does remind me of Cameron Maybin. Maybin is a bit taller, but both are high waisted and have long legs. In addition, each seems to have a bit of electricity in their legs that makes them uneasy just standing around, seeming to prefer constant motion. Maybe it's an abundance of fast twitch muscle fibers or just too much sugar in their diet, but whatever it is they seem to have a bit more bounce in their step than other prospects. Unfortunately, Oliveras still isn't very strong, but he has an average arm and above average speed. Hopefully, he'll continue to add muscle as he matures, as he'll need it to avoid being overpowered by more advanced competition. Oliveras has a smooth left-handed swing, which is what first caught my eye. He utilizes a significantly wider than shoulder width stance, which prevents him from using any kind of stride at the plate. In addition, he hits out of a bit of crouch, which looks a bit unusual given the wide stance that he employees. Like most hitters who utilize the wide stance, he doesn't use a stride. The width of the stance results in a hitter being limited to simply lifting his front foot up and setting it right back down to trigger his weight transfer. However, when Oliveras sets the front foot back down, he has the tendency to open it up. When he first gets into his hitting stance, his toe is pointed directly towards homeplate, but when he sets the foot back down after his stride, the toe is often pointed more towards third base than it was before the stride. This new front foot position can lead to Oliveras opening his hips too soon, which bleeds power from the swing. If the hips fire too soon, then it becomes more of an arm swing, which results in the hitter rolling over the ball and generates a lot of weak groundballs to the right side of the infield (which helps explain his high groundball %). While I usually don't mind a wider stance and a negligible stride (it has worked wonders for both Joe DiMaggio and Albert Pujols), I'd actually like to see Oliveras shorten up his stance and take a longer stride at the plate. I think that would help him drive the ball a bit better and prevent him from firing the hips too soon. As it stands now, he isn't getting enough line-drives, instead hitting the ball on the ground a high percentage of the time. Oliveras employees a high hand position, as he takes his stance with his hands up by his left ear. This isn't uncommon and is a pre-pitch hand position shared by fellow prospect Yonder Alonso. As the pitch is delivered, Oliveras lifts his front foot to begin his weight transfer and brings his hands down and back to shoulder level, which puts them into a good hitting position. Overall, Oliveras gets into good hitting position when the pitch is delivered. After the swing passes through the hitting zone he takes his top hand off the bat, but he has a much shorter follow-through than is typical for one handed finishers. He doesn't release the bat on the follow through and let it come all the way around in typical fashion, but rather restricts its movement at the finish of the swing. It more resembles the Fred McGriff follow-through than the classic Will Clark follow-through. While this is typically just an aesthetic difference, sometimes cutting the swing short can result in a loss of power. If the hitter is restricting the swing too soon, then he may be limiting his shoulder rotation. If the hitter isn't getting good shoulder rotation, then the bat may actually be decelerating at the point of contact, which would obviously reduce the power generated. Right now, Oliveras seems to get sufficient shoulder rotation, so it's not likely a problem, though I wouldn't mind seeing him "let the swing go" a bit more, as it might help him tap into a bit more power as he climbs the ladder. He'll never be a power hitter, but he'll need a bit more pop if he is going to develop into a prospect of note. You can see his scouting video here. While Oliveras still has a LONG way to go on the road to the majors and plenty of time to take a wrong turn, for now he checks in at #25. Last year he was under the "Other Notables" and he took enough of a step forward for me to reward him with the last slot on the big list. Once again, Alexis showed JUST enough to pique my interest. He may ultimately never pan out, but for now he's more interesting to me than the Chris Heisey types who project as nothing more than 4th outfielders and, besides, we've heard enough about those guys already. Still, he's admittedly a bit of a long shot to make it to the majors and have a productive MLB career. Even so, Oliveras gets the nod for the 25th slot, but he'll have to show something more in 2009 to warrant inclusion on the 2010 list. The newly acquired Dallas Buck checks in at #12 on the list. I probably like Buck more than most, but he has a number of things going for him. He may be ideally suited for the Reds, as he possesses heavy groundball tendencies and is a natural athlete, as evidenced by being a two sport athlete at Oregon State before joining the professional ranks. He strikes me as being a potential sleeper, as injuries may have obscured his upside. In 2009, he will be a year farther away from his arm problem, so he could reveal a much better career trajectory than previously projected. Oddly enough, Dallas Buck's baseball skills may be best defined by his time playing a different sport. Buck attended Oregon State and spent two years playing defensive back and special teams for the Beaver football team. That speaks to both his athleticism and his athletic mindset, which carries over to the diamond. Buck had a very good career at Oregon State, but his junior season was hampered by an arm injury. Buck has a football player mentality and refused to shut it down, as he didn't want to let his teammates down in their quest for a College World Series Championship. He battled through the season and maintained a high level of performance despite diminished velocity. The diminished velocity and the fear of injury it inspired caused his draft status to slip, as he was a projected first round pick before his junior year. The Diamondbacks selected Buck in the third round (two picks after the Reds selected Chris Valaika) and a subsequent physical exam uncovered the expected injury: a partial tear in the ulnar collateral ligament. Buck was likely to need Tommy John surgery before ever throwing a professional pitch. Despite the likelihood that surgery would be necessary, the Diamondbacks agreed to let Buck attempt to rehab the injury. In 2007, Buck started out his professional career at high-A ball, where he posted a respectable 3.41 ERA, 1.18 WHIP, 2.9 BB/9, and 8.1 K/9 in 97.2 innings. He also demonstrated impressive groundball tendencies, as he posted a GB/FB ratio of 2.28. Ultimately, he had to shut it down after 16 starts and undergo Tommy John Surgery in August. Buck made a fairly quick recovery and has already logged 63.2 innings in 2008. In that span, Buck has posted a 3.68 ERA, 1.12 WHIP, 37/15 K/BB ratio, and a stellar 2.23 GB/FB ratio. After his acquisition, the Reds sent Buck to high-A Sarasota, where he has posted a 4.15 ERA, 1.00 WHIP, 9/4 K/BB ratio, and a stellar 4.00 GB/FB ratio in 13.0 innings. As a sophomore, Buck's fastball sat in the 88-91 range and touched up to 94 on occasions. As a junior, his velocity dropped into the mid-80s, which was a clear sign that he was having arm trouble. However, his fastball has always had very good sink and he uses it to induce a ton of groundballs. Buck also features an average slider and an improving change-up. In attempting to pitch through the injury in 2007, Buck was working without his good stuff. The UCL tear sapped his velocity and he was only throwing 86-88 mph with a lot of effort. The impressive thing is that despite working without his best stuff, Buck STILL managed to be successful. To me, that signifies an ability to pitch, not just throw. A lot of younger pitching prospects just rely on their pure stuff, but really don't know how to use it. Buck, obviously knows how to pitch. In addition to demonstrating the ability to succeed without his best stuff, Buck actually managed to impress scouts with his change-up. In 2008, despite being healthy, Buck again is pitching without his best velocity, but again is finding success. The usual rehab time on Tommy John is 10-12 months, but the pitcher often isn't the same until the season after he comes back. So, Buck should finally be at full strength for the first time in his professional career in 2009. Buck doesn't have the cleanest mechanics, but they are functional. The athleticism that allowed him to play college football also allows him to repeat his delivery and maintain good body control. Following the modern trend, Buck starts his windup by moving his glove side ("GS") foot slightly forward and towards first base, as opposed to the old style of starting the wind-up by stepping back towards second base. After he plants his glove side foot, he"un-weights" his pitching arm side ("PAS") foot and rotates it on the rubber. In keeping with the modern pitching style, he only brings his hands up to his chest, not over his head as used to be traditional. Buck has a high leg kick and brings his leg up well past parallel. In his leg kick, he coils his lower body to store up energy. When his leg kick is at its highest point, Buck breaks his hands and begins to drive towards the plate. Buck really seems to get a good push off the rubber and uses his legs to drive his body towards the plate. 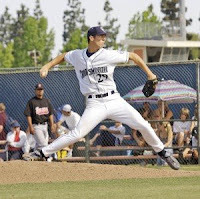 A strong leg drive can help incorporate the entire body into the throwing motion, which can alleviate some of the stress on the arm that can be created by more of a "falling off the rubber" style pitching motion. After Buck drives off the rubber, he plants his GS foot slightly to the third base side of mound. By planting his foot closer to third than normal, Buck is forced to throw slightly across his body. He utilizes a high three-quarter arm slot and uses a clean arm action, but this type of cross-fire action can lead to increased stress on the arm. In Buck's case, it isn't a significant cross-fire, but it's there. Another by product of the cross-fire throwing action is that it forces him to fall off to the first base side of the mound on his follow through. His pitching momentum is heading slightly towards first base to offset his somewhat closed body position, so his body naturally follows the momentum after he delivers the pitch. You can access his scouting video here. Buck's mechanics certainly aren't the prettiest or cleanest around, but they do seem functional. He doesn't have any big red flags in his motion or arm action, but he does throw with some effort. It'll be interesting to see if he can stay healthy, as there isn't really anything significant in his motion that indicates a heightened injury risk. The Reds won't quite know what they have in Dallas Buck until the 2009 season, as that's when he'll finally be at full strength, but I suspect they'll be pleasantly surprised. However, even at less than full strength he demonstrated some positives. His athleticism gives him good body control, his football experience gives him a warrior mentality, and his fastball has very good late sink, all of which makes him an intriguing prospect for the Reds. While it is too soon to tell, Buck could be a very nice addition to the organization, as he has a solid skill-set and seems to be exactly the type of player the Reds need. Buck is the type of player who gets the most out of his abilities and puts the needs of the team before his own. Those seem to be the type of players commonly found on winning teams, which hardly seems like a coincidence. The Reds could start Buck off at double-A Carolina for 2009, although I wouldn't be surprised to see him start off at high-A Sarasota for a month or two to build his confidence. While Buck will never be a dominant #1 starter, he may ultimately prove to be a solid mid-rotation starting pitcher. The 2009 season will go a long way towards revealing what type of pitcher Buck will be, but for now he checks in at #12 on the list. I suppose it's difficult to complain much about the Arthur Rhodes signing, but I'll do my best. Why does this signing seem like deja vu all over again? Let's see, the organization deems itself so desperate for a lefthanded reliever that they throw a multi-year contract at an elderly lefty coming off a single bounce back season after several years of lackluster performance. Well, I suppose we can realistically hope for better, as Rhodes has much better stuff and is far less dependent on the team's defense. In 2008, Rhodes struck out 10.19 hitters per nine innings, while Stanton regularly sat in the ~6.0 K/9 range. Any time a Reds pitcher can avoid relying on the team's inept defense the better, so Rhodes has that going for him. In addition, Rhodes mainted good velocity on his fastball, which averaged 91.4 mph and regained some velocity on his slider, which was back up to an average 83.6 mph for the first time since 2005. So, while there are a few positives on Rhodes, I'm still not sure it was the best way to go. Over the past 3 years, Rhodes has been appreciably better against lefties (.220 BA and .295 OBP) than righties (.266 BA and .379 OBP), so Dusty will need to fight the urge to over-utilize Rhodes if this deal is going to work out at all. Once again, the Reds have acquired a player who really doesn't seem likely to make the Reds appreciably better. At the very least, I suppose the risk is fairly low given the annual salary that he is set to make. However, I think the upside is rather limited as well and there is significant performance risk. Treading water seems to be the order of the day in Cincinnati this offseason. I would like to see the Reds pursue players who would actually improve the club. In this instance, I would rather have seen the Reds pursue Huston Street. The Rockies were rumored to want Aaron Heilman and Pedro Feliciano from the Mets in exchange for Street. It would seem that an equivalent Reds package would be Micah Owings and Billy Bray. If that's the case, I would have pulled the trigger and not thought twice. Bray is a nice pitcher, but I'm just not sure there is any more projection left in him, which would make him a solid lefty reliever and nothing more. The idea of a back-end of the bullpen consisting of Jared Burton in the 7th, Huston Street in the 8th, and Coco Cordero in the 9th is something devoutly to be wished, as the Reds could shorten games to 6 innings. That kind of shutdown bullpen would be the best in the NL and probably all of baseball. Not to mention, it would be the best bullpen the Reds have had since the Nasty Boys were roaming the earth. To me, acquiring a player like Street would actually improve the team. Street is an impact player, while Rhodes is not. The cost is higher on Street, but so is the reward. The Reds are now in a position where they should be willing to pay a higher cost for a better player. They have the value in the organization to afford better, more long-term solutions. The days of having to settle for retreads and second-hand goods is over. So, once again, I'm underwhelmed by the acquisition, but this time I fear that it will blow up in a Mike Stanton type way. The Reds should have set their sights higher than mediocre stopgaps like Ramon Hernandez and Arthur Rhodes. It seems like a missed opportunity, as they could have acquired players who were a cut above, like Jarrod Saltalamacchia and Huston Street. Impact players who could have pushed the Reds up the standings in 2009 and still been in the mix for 2010 and beyond. Instead, they have acquired players who will at best be stopgaps until as yet identified players arrive in the future to take over those roles. Unfortunately, it seems like the continuation of yet another mediocre offseason for the Reds where the goal is to appear to be improving without actually paying the price to do so. Reds baseball: Full of sound and fury signifying nothing. Now, this is truly must see t.v. for Reds fans. Neftali Soto cranking homerun after homerun in the 2006 PowerShowCase amateur homerun derby. You don't often see such a beautiful, free flowing swing from a righthanded hitter. And, you don't typically see such raw power in young prospects. Given his swing and raw power, it's no surprise that he broke Juan Gonzalez's amateur homerun record in Puerto Rico. And, here's a scary thought, he's only going to get stronger as he fills out. Anyway, enjoy, Reds fans!!! Well, better late than never, time to weigh in on the Ramon Hernandez trade. While the Reds obviously need a catcher, it's hard to think too much of this deal. We had an obvious need for a catcher, but I would much prefer us to address that need in a different manner, ideally by acquiring a long-term solution. To do so, they could either acquire an impact young catcher or a quality veteran. Instead, the Reds chose door number 3. First option, I would have loved to see us acquire either Jarrod Saltalamacchia or Taylor Teagarden. Either one would have been tremendous, but given how highly the Rangers seem to regard Teagarden, it likely would have been Salty. And, frankly, that would be just fine with me. Salty, as a 23-year old, posted a line of .253/.352/.364 in 230 plate appearances. While that may not seem all that impressive, his splits make it more impressive. As a lefty, Salty hit .311/.426/.451/.877. However, as a righty he fared much worse, posting a slash line of .158/.220/.224/.444. Clearly, Salty has a lot of work to do from the rightside, but a 23-year old catcher who can post a .877 OPS as lefty? Where do I sign up? Not to mention, it makes all kind of sense for both, as the Rangers have a glut of catchers and need pitching, while the Reds had a hole behind the dish and a surplus of pitching. Unfortunately, it seems like the Rangers set a very high price on their catchers, so maybe a deal wasn't likely to happen. However, this is the type of deal that the Reds should have pursued. It would have been a long-term solution, rather than just a mediocre stopgap. Second option, they could have acquired a quality veteran catcher along the lines of Russ Martin. I can't imagine that he was actually on the block, but there were such rumors coming out of Los Angeles. Either of those options would have represented an actual upgrade. Unfortunately, we chose to follow a different path. We acquired a veteran catcher who isn't likely to be appreciably better than what we already had. To acquire Ramon Hernandez, the Reds gave up Ryan Freel, Brandon Waring, and Justin Turner. Freel was simple a salary dump, and I won't much miss Waring, but I would have preferred to hang on to Turner. So, while the cost wasn't exorbitant, Hernandez wasn't exactly free, either. And, what exactly did we get for Freel, Waring, and Turner? Ramon Hernandez is a player who has already caught 9,528 MLB innings, which is the type of workload that usually catches up with catchers at the plate. The wear and tear from strapping on the tools of ignorance for so many years really diminishes the offensive production of veteran catchers. Not surprisingly, he is coming off of two consecutive seasons of .714 OPS. When he was younger, I actually liked what Ramon Hernandez brought to the table, as he offered a well rounded game with a quality righthanded stick. He even managed to hit 20+ homeruns twice in his MLB career. Once in 2003 (21 bombs) with Oakland and once in 2006 (23 bombs) with Baltimore. Unfortunately, it seems doubtful that he'll reach those heights again in Cincinnati. In 2006, Ramon benefited from his highest number of plate appearances ever (560) and a homer friendly ballpark. I think it's worth remembering that Camden is VERY homer friendly. And, in fact, it's MUCH easier for righties to hit homers in Camden than lefties. So, Hernandez won't be moving into a hitting environment that is much better than the one he is leaving, so there isn't likely to be a significant boost from the new home ballpark. At best, he seems to be mediocre stopgap. Personally, I think the Reds missed a real opportunity to make an appreciable, long-term upgrade behind the dish. The Reds have a deeper farm system than in years passed and adding a young impact bat behind the dish would have made the Reds significantly better. If we really didn't want, or weren't able, to acquire a young impact catcher like Jarrod Saltalamacchia and instead insisted on turning to an older veteran, then I'm not even sure that Hernandez was the best option. I still have to wonder if Kenji Johjima wouldn't have been the better target on this particular organizational path. The funny thing about Johjima is that while his overall 2008 stats look pretty putrid, his component stats aren't too shabby at all. In fact, they may be BETTER than his component stats from 2006 & 2007. Obviously, his 2008 season was a bust, but lost in the mosh pit of people jumping up and down on Bill Bavasi for extending Johjima's contract is the fact that Johjima may have been more unlucky than anything in 2008. So, despite falling completely off the table in 2008, he actually increased his Line Drive rate. What about his selectivity and contact rate? So, he actually walked more, struck out about the same amount, and made contact at an even higher rate than in the past. So, how did his numbers fall off the table? Well, the obvious answer is the hit luck. His BABIP was a paltry .233, which is very low for someone who hit 21.1% line drives. So, that should be expected to rebound. In addition, his rate of infield fly balls was up, which seems like a fluke more than anything else. Infield fly balls are the most automatic type of out a hitter can make by putting the ball in play, so the fewer of these the better. Still, his IFFB% jumped from 12.6% in 2006 and 13.2% in 2007 all the way up to 17.2% in 2008. In 2009, his BABIP and IFFB% should return to more normal levels and Kenji should return to being the high contact, early count hitter that he has been in the past. Even though I prefer patient, late count hitters, Johjima is the type of player for whom many Reds fans have been clamoring over the past few years. Not to mention, he's a better defensive catcher than Hernandez, as evidenced by his 32.5% career caught stealing rate. And, to top it off, he actually WOULD get a significant boost from switching to GABP, as Safeco is a very tough place to play. Quality righthanded hitters like Jeff Cirillo, Adrian Beltre, Rich Aurilia, and Richie Sexson have all had their careers derailed by the menace that is Safeco Field, so I don't think it would be unreasonable to expect Kenji to have received a significant boost in Cincinnati. I would imagine the Mariners would have been willing to eat some contract to move him and he's the type of player who actually could get a big offensive boost from a fresh start and a hitter friendly park. I still can't believe I'm actually saying it, but Johjima would have been a better pickup in my opinion. Personally, I think giving up quality prospects in exchange for a quality young MLB catcher would have been far and away the best course of action. I have no problem dealing value from our farm system for a young MLB player who could have solved our catching problems for the next 5-10 years. Unfortunately, we acquired a mediocre veteran who is unlikely to make any kind of appreciable impact on the Reds and whose acquisition seems to indicate that the Reds are willing to just tread water in 2009. At the rate the Reds are going, it seems like another disappointing and lackluster offseason for the Reds. Hopefully, things will improve from here on out, but I'm not overly optimistic.